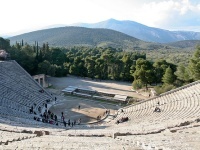 A definite must on a tour of the Peloponnese is the famed ancient theatre of Epidaurus, built in the 3rd century BC and so well preserved that with little or no restoration it is still in use today for regular summer dramatic performances, which are lent a mystical aura by the beautiful and ancient setting. The theatre has perfect acoustics, allowing even a whisper on stage to be heard in the back row of the limestone amphitheatre, which can seat 14,000. North of the theatre are the ruins of the healing Sanctuary of Asklepios, which has a museum explaining how the original temple complex would have looked and functioned. This was once the most famous healing centre of the Greek and Roman world, and some argue that it is the birthplace of modern medicine. It is very interesting to learn about the evolution of medical treatment in this place and to explore the ruins and remains of the sanctuary, which once spawned 200 dependent spas throughout the Mediterranean. Where the ancient town of Epidaurus once stood there is now the modern day village of Palia Epidaurus. This is a popular seaside resort with scenic beaches, a small harbour and several tavernas. Address: Archaeological Museum of Epidaurus, Asklepieion.